Fantastic cdv of Forrest Spofford, 8th CT Volunteers Wounded at Antietam. (See Military Images, Spring 2015 issues for a similar cdv of Sgt Spofford with description of his history). This cdv shows damage on the pants as seen in the photos attached. Please enlarge the photo to see the damage. It doesn't really effect the quality and content of the image in my opinion. Trumps the minor condition issue. The image is backmarked W. The cdv is full size and not cut down and is without any bends or damage other than what is disclosed in the above description. 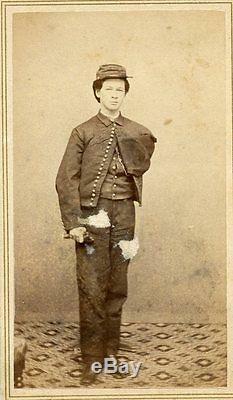 Spofford Fought with the 8th CT at Antietam where he was severly wounded causing him to lose his left arm. Spofford eventually rejoined his unit where he was promoted to Sgt Major. At the battle of Port Walthall Junction, Spofford suffered his second wound to his other arm! He did survive the War. His history and unit history tells the story of this valiant soldier! 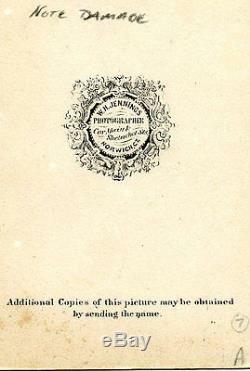 This is a great cdv with super history! Thanks for looking at my item. PLEASE ENLARGE ALL PHOTOS ATTACHED FOR CONTENT AND CONDITION. I SELL TO THE USA ONLY! The item "Civil War Soldier Id'ed Amputee CT Vol's Forrest Spofford, Wounded Antietam CDV" is in sale since Sunday, May 31, 2015. This item is in the category "Collectibles\Militaria\Civil War (1861-65)\Original Period Items\Photographs". The seller is "bofonz" and is located in Paramus, New Jersey. This item can be shipped to United States, to Canada, to United Kingdom, to Australia, ZA, to Ireland, to Mexico, to New Zealand, SG, AE, MY.